BLACKTHORN: THUNDER ON MARS– Best New Pulp Character of the Year! BLACKTHORN: THUNDER ON MARS won “Best New Pulp Character” at Pulp Ark 2012! Betrayed and left for dead on the battlefield, US Army General John Blackthorn awakens many thousands of years later to find himself trapped amidst the ruins of a post-apocalyptic Mars, his only companions a savage Mock-Man and a mysterious sorceress. Their war to free this strange new world from oppression won’t be easy: Arrayed against them are the four tyrannical First Men–masters of magic and technology alike–the dreaded Sorcerers of Mars! 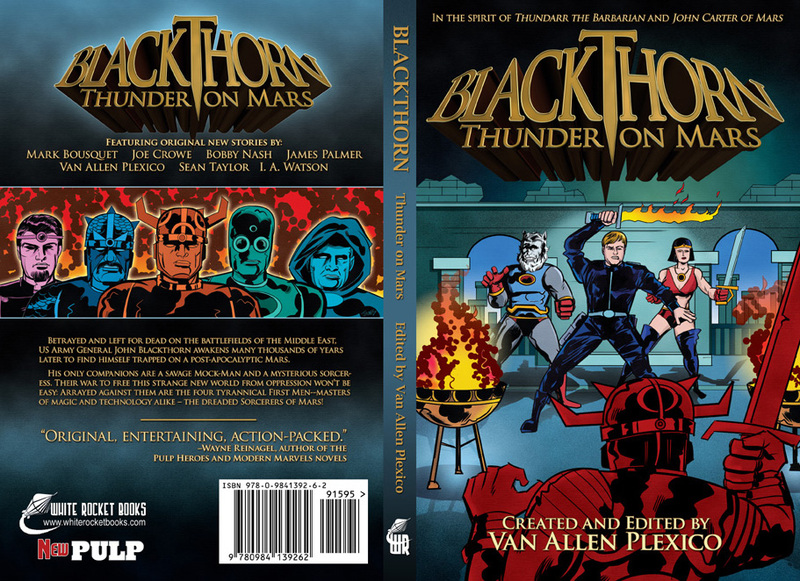 BLACKTHORN: THUNDER ON MARS is a post-apocalyptic adventure saga in the spirit of “Thundarr the Barbarian” and “John Carter of Mars,” featuring original stories by New Pulp luminaries Mark Bousquet, Joe Crowe, Bobby Nash, James Palmer, Van Allen Plexico, Sean Taylor, and I. A. Watson, and illustrated by Chris Kohler. Cover by James Burns. “Original, entertaining, action-packed!” —Wayne Reinagel, author of the Pulp Heroes and Modern Marvels novels. This entry was posted on July 1, 2012 by vplexico. It was filed under Uncategorized and was tagged with Blackthorn, Bobby Nash, Chris Kohler, I. A. Watson, James Burns, James Palmer, Joe Crowe, John Carter, Mark Bousquet, Mars, Oglok, Princess Aria, Sean Taylor, Thundarr, Van Allen Plexico. White Rocket Ep 20: Superheroes in Novels & Beyond, Pt 3: Just Cause! BLACKTHORN: DYNASTY OF MARS Novel– Continues the Apocalyptic Saga!